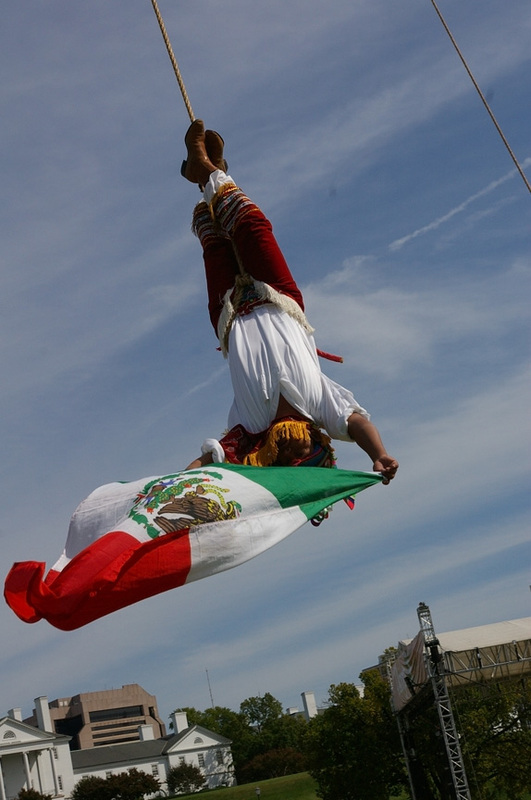 A celebration of music, dance and culture from across the world! 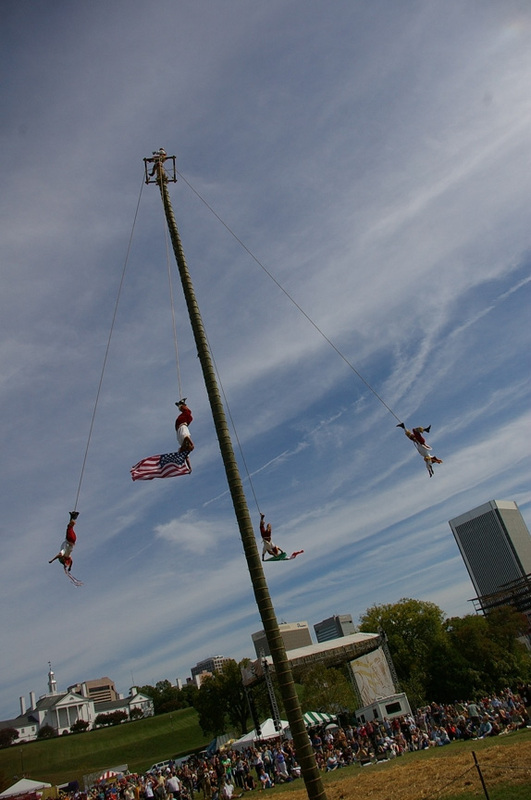 RICHMOND, Va. (Saturday, October 11, 2008) – Wednesday morning, a small crowd of people came to watch a key event in the preparations for one of the performances at the Richmond Folk Festival – the raising of the pole from which Tezcatlipoca Voladores, a quintet of Mayan “Flying Man” sundancers, will dance and then “fly” back to the ground as their ancestors have been doing for 2,000 years. First, a hole 13 feet deep needed to be dug. 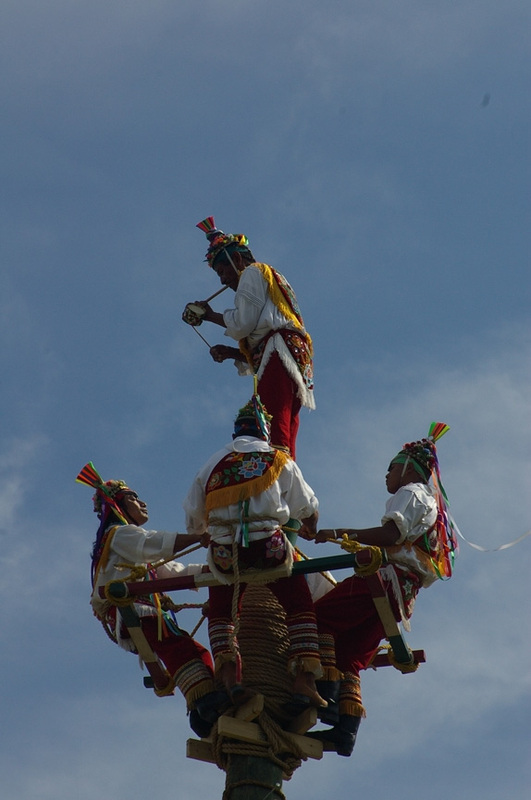 Then two members of the Tezcatlipoca Voladores, David Garcia, a shaman, and Apolinar Simbrón, the group’s director, would perform a ritual blessing of the site to ensure the group’s safety. 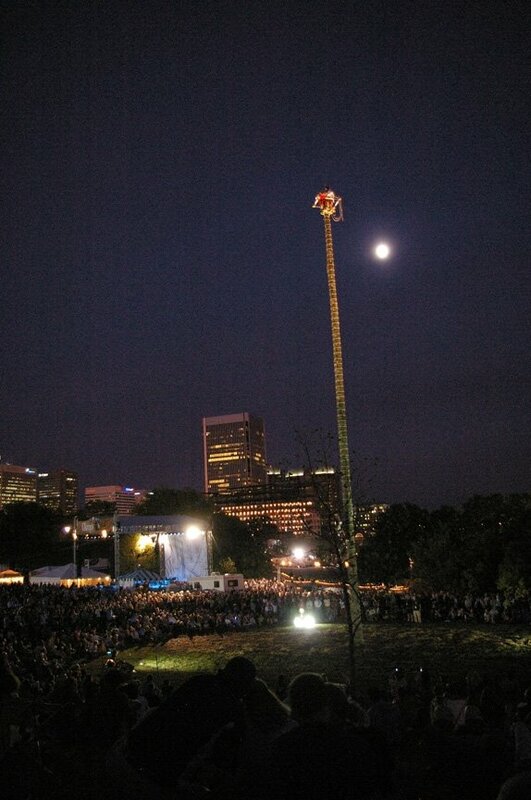 Unfortunately for the crowd, the setting of the pole had to be delayed. 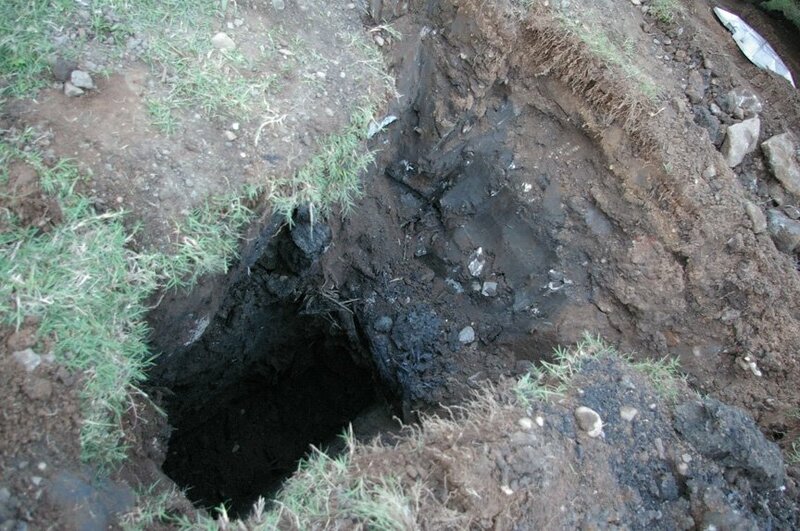 Attempts to auger into the soil on the grounds of NewMarket Corporation’s property along Second Street met with failure about two feet down. A layer of rock and other material lay in the way. 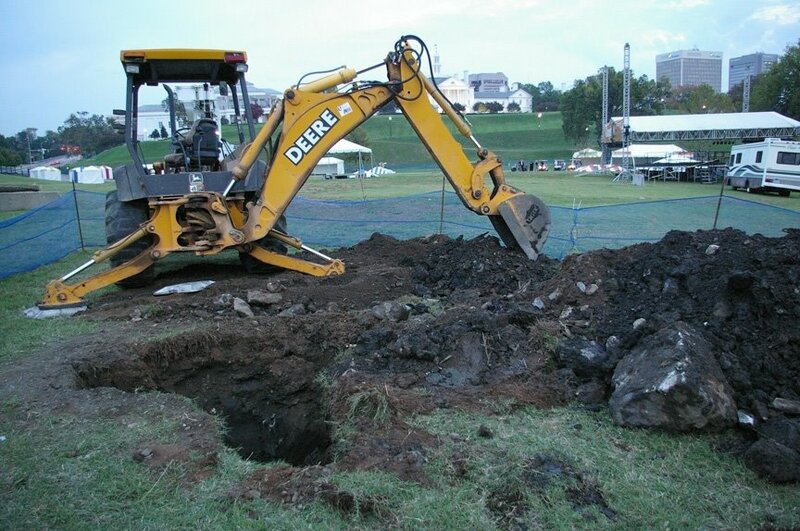 After several attempts to bore deeper met the same fate, the crew from C. W. Wright Construction called in a backhoe and waited through the afternoon for it to arrive, and by Wednesday evening, the hole was dug – the pile of material containing large chunks of concrete, rocks, and even debris from buried timbers. Given the hour, the blessing ceremony would have to wait. The “Flying Man” sundance has long been practiced by the Totonacs of Mexico. The nation has lived the rain forests of Veracruz for at least two thousand years. 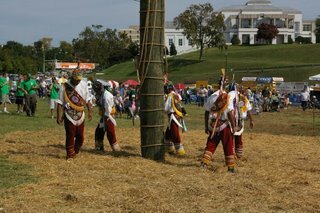 At their culture’s peak, they built pyramids and other religious structures that rivaled other Mesoamerican groups such as the Aztecs. 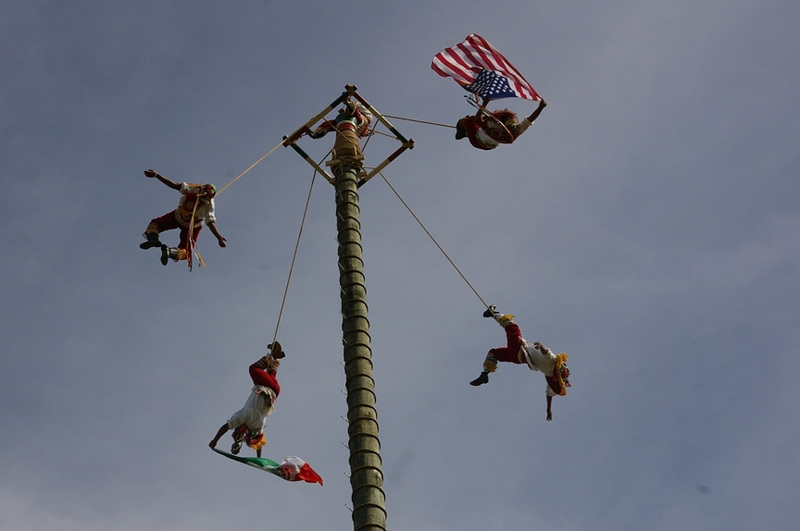 All but one of the Tezcatlipoca Voladores hail from El Tajín, an ancient city in the Totonac heartland, about halfway between the better known cities of Tampico and Veracruz. The dance traditionally serves a number of purposes for the Totonac, such as to honor the Sun, to heal the sick, and to bring rain to parched crops. 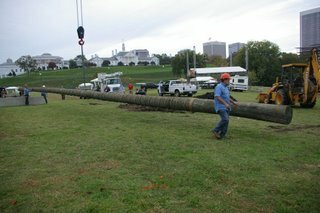 By 7 a.m. on Thursday, a smaller crowd awaited as the construction crew prepared the more than 90-feet-tall pole for movement into a position close to the hole. The riverfront was quiet, traffic barely noticeable, only small flocks of geese announcing their imminent passage. The work on the pole was painstaking. 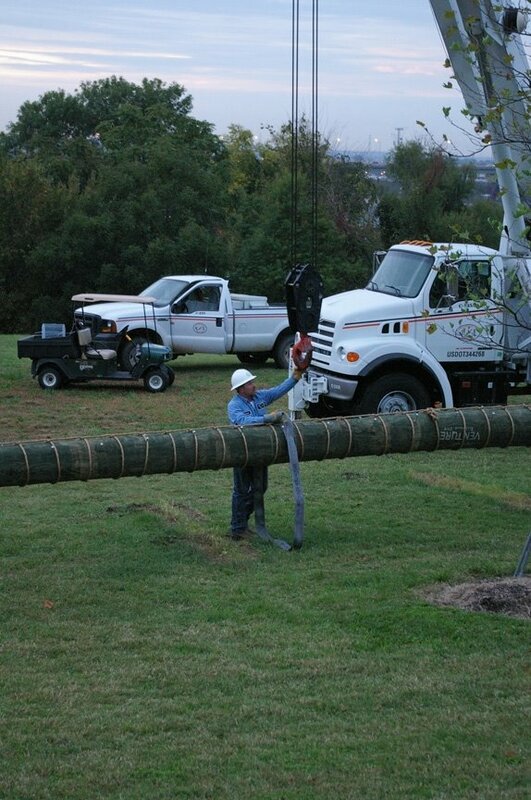 Place a lift strap about mid-way up the pole. 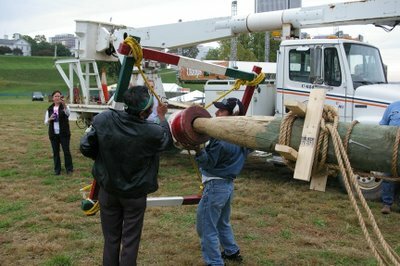 Hook the strap to a cable from a crane. 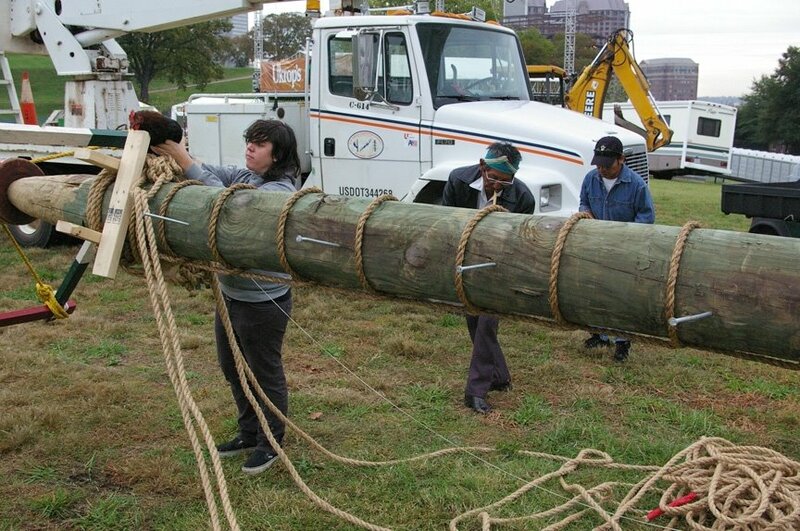 Move the pole, minding the ropes that the members of the group will use to swing down to the ground as well as the spikes hammered into the pole for them to climb. Stop, reposition the lift strap, and move again. 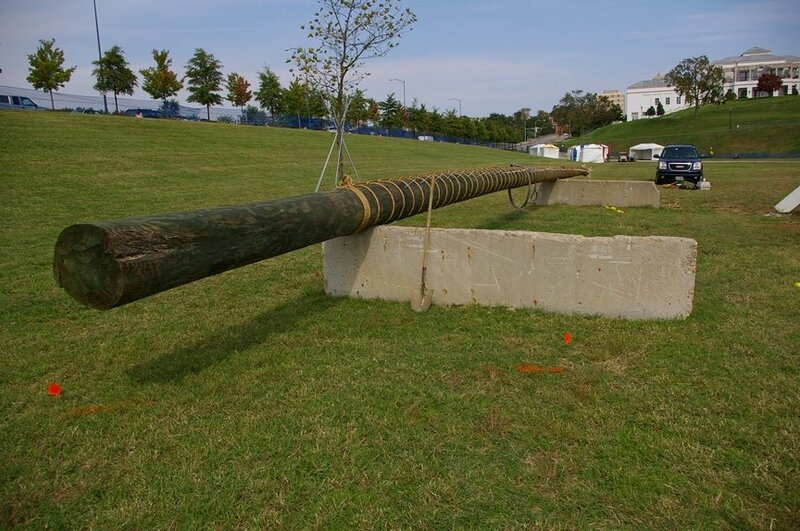 About 30 minutes after the construction crew began, they stopped. 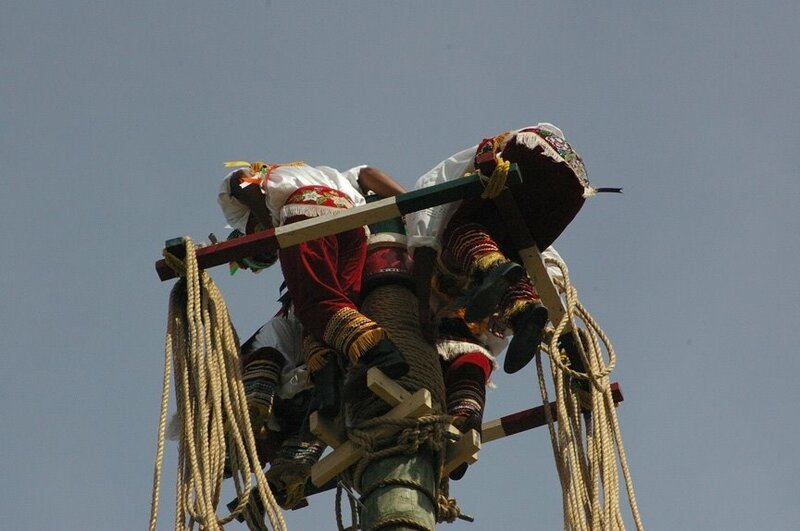 Garcia and Simbrón positioned a platform made up of a central wooden drum with a square wooden frame attached via ropes over the top of the pole. 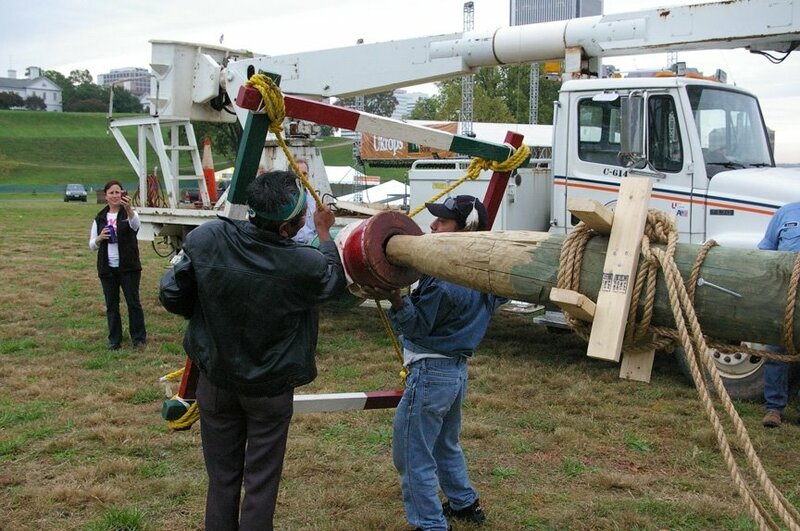 The drum, hollowed out, fit over the pole’s cone-shaped tip. 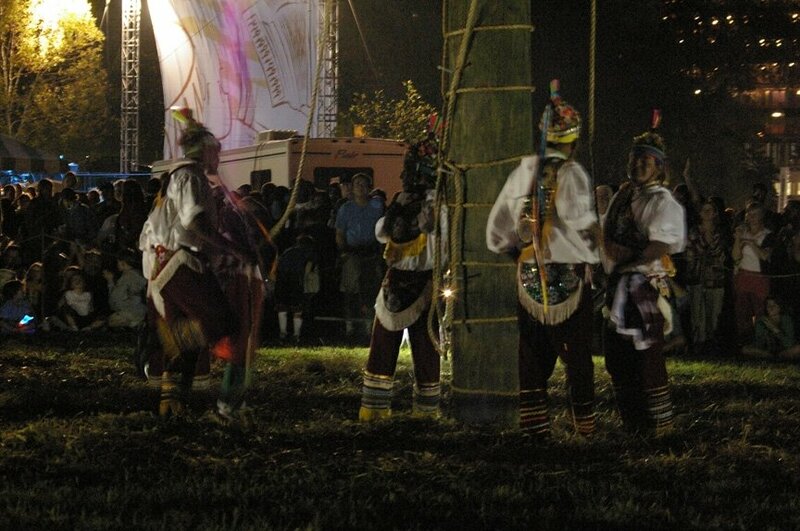 As the sun was beginning to rise behind the clouds on the Eastern horizon, Garcia and Simbrón began their ancient blessing ritual – a plea to the spirits of their ancestors for protection during the sundance. Garcia lit a cigarette and set it aside. 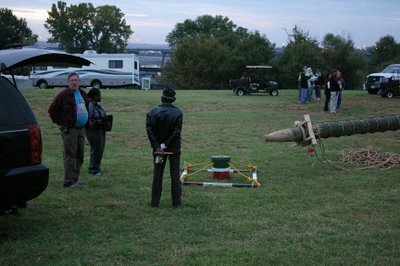 The two men sprinkled tequila into the hole – from each of the four cardinal directions: on the north, west, south, and east sides of the hole. 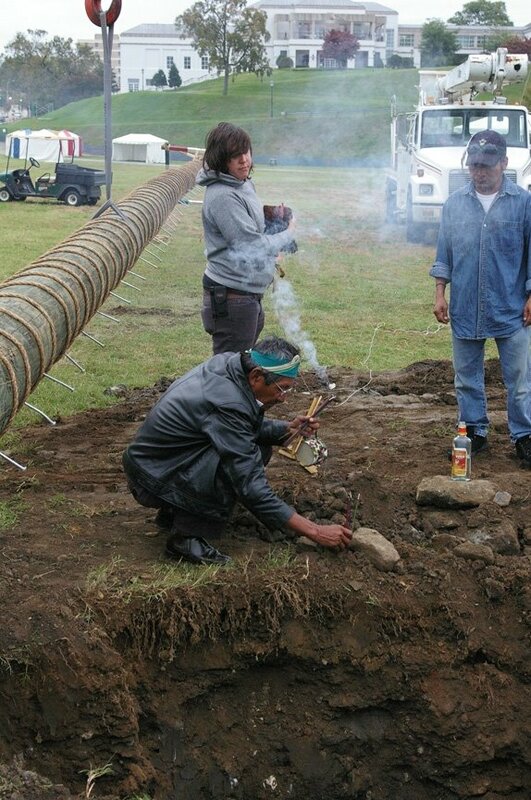 Garcia and Simbrón placed smoking incense sticks around the hole, also at the north, west, south, and east sides. As they did so, Colleen Arnerich – asked to help with the ceremony to provide a required female spirit – brought a rooster to the site. 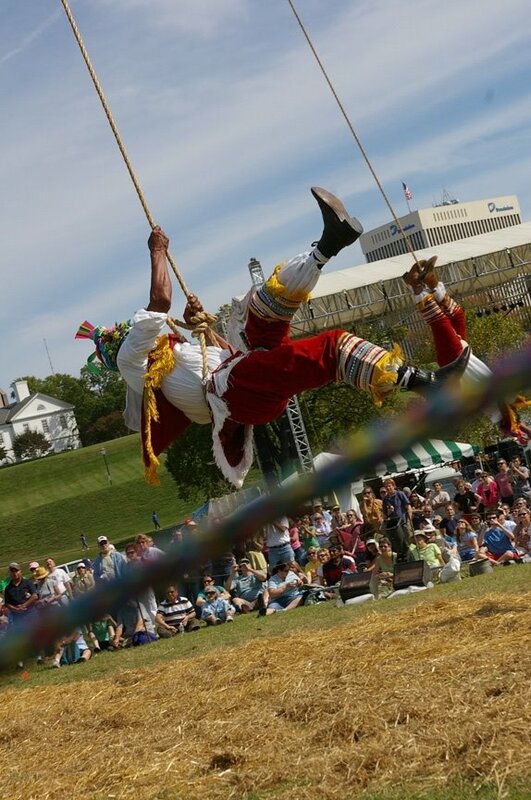 Garcia tied the rooster’s legs to a string, and lowered the resistant rooster into the hole. 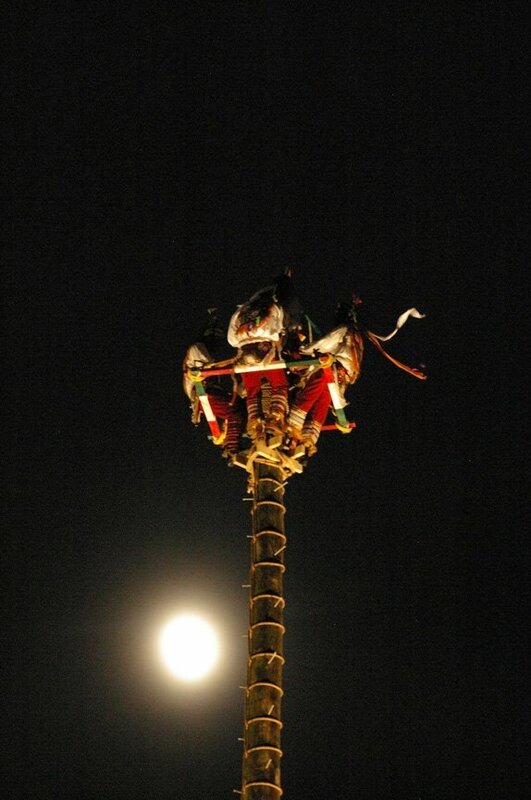 The role of the rooster, as well as other animals used in the ceremony, is to imbue the pole with its spirit. Once in the hole, the rooster calmed down, and Garcia began playing a bamboo flute while simultaneously banging a small drum. He and Simbrón danced around the hole, again stopping at each of the four cardinal directions, then Simbrón pulled the rooster out of the hole. 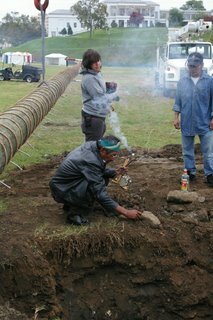 Garcia put the cigarette on a rock on the north side of the hole, where the smoke from it and the incense served as an offering to their ancestors. 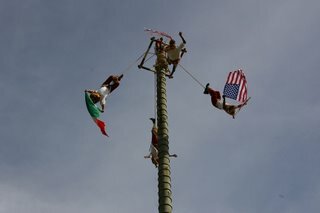 The three began to bless the pole. 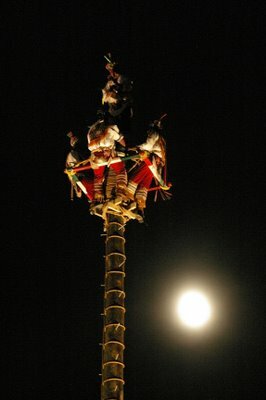 First stopping at the middle, Arnerich held the rooster on the pole while Garcia played his flute and drum and he and Simbrón danced. 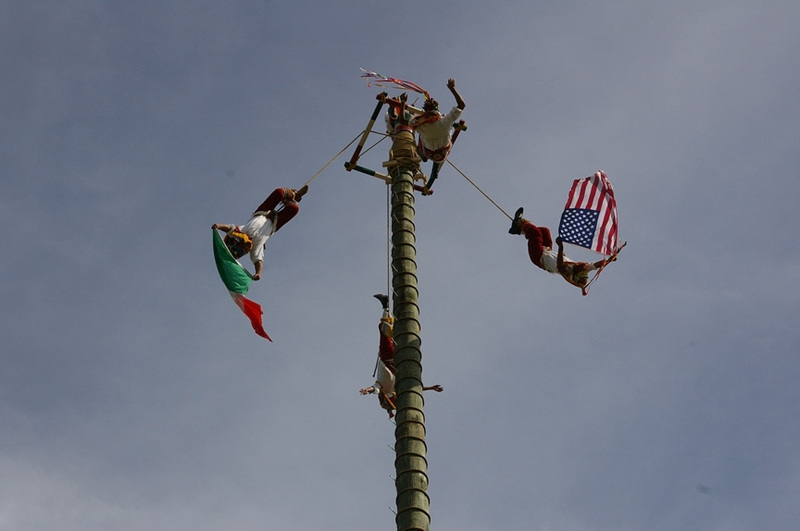 They stopped again at the top of the pole, just below the platform, with Garcia and Simbrón dancing first on one side, then by the top of the pole, then on the other side. 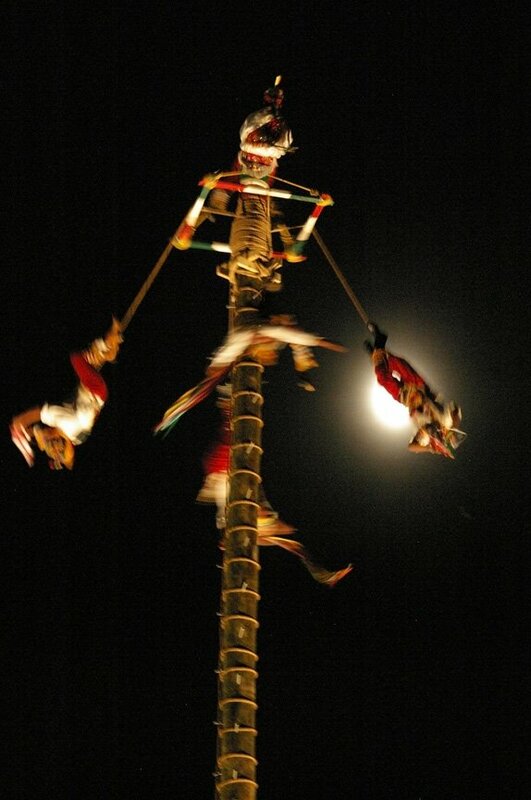 They moved back to the middle of the pole on the opposite side of where they began, repeated the dance, and finally moved to the base of the pole. 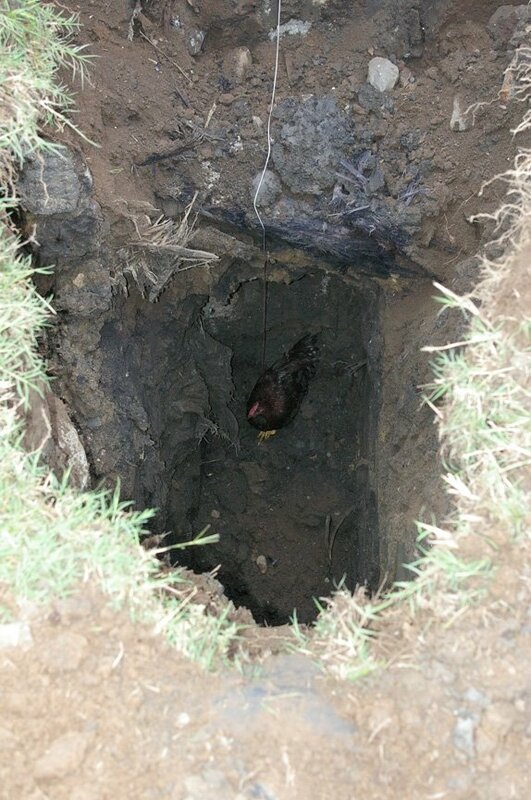 Despite the rooster’s protests, he was lowered back into the hole. 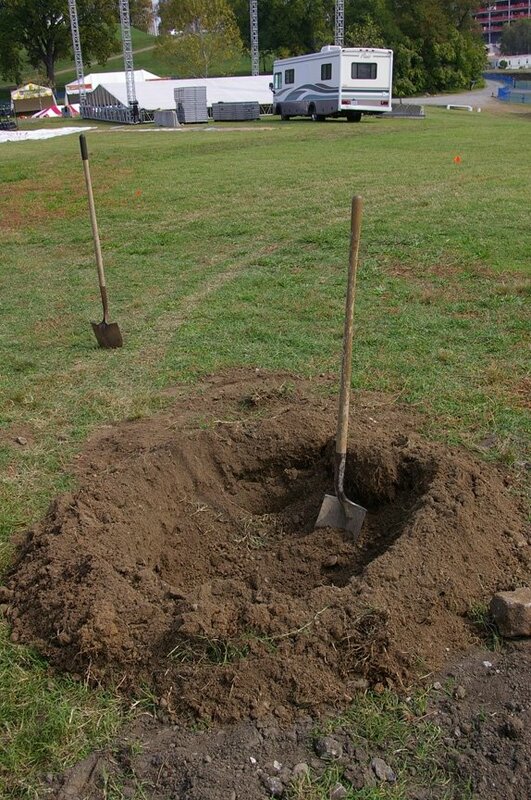 Garcia and Simbrón repeated their dance around the hole, then all three sprinkled tequila into the hole from all four cardinal directions. 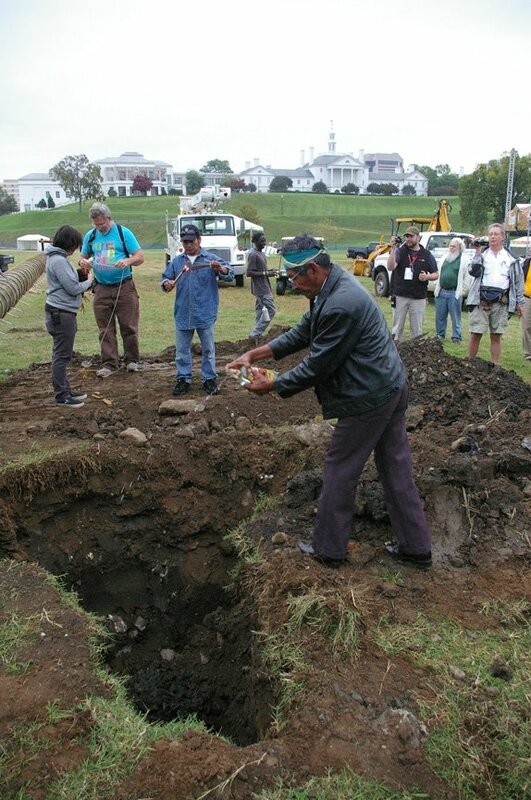 At the blessing’s conclusion, the rooster was pulled back out of the hole. Garcia tossed the burning cigarette in. All three – with rooster in hand – got out of the way to let the construction crew get back to work. The crane lifted the pole, the men positioned the base over the hole, and lowered it in. 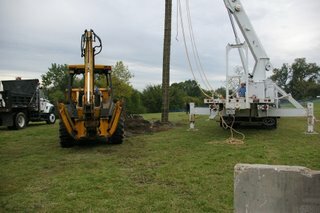 Within minutes, a cement mixer arrived on site to fill the space around the pole with concrete. 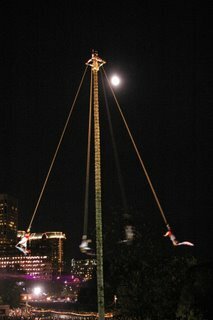 The blessing ceremony was interesting, but the actual performance of the sundance was spectacular. 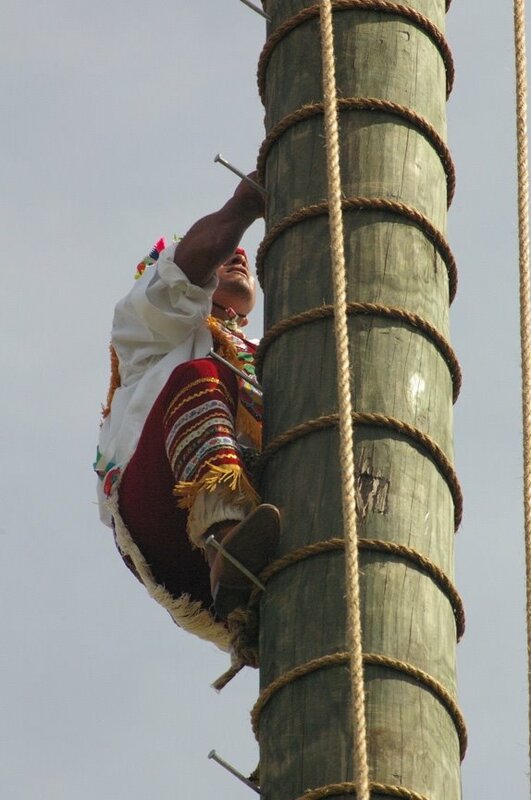 The quintet, most of whom hail from El Tajín, Veracruz, Mexico, began with a prayer and dance – again featuring the flute and drum – around the base of the pole. 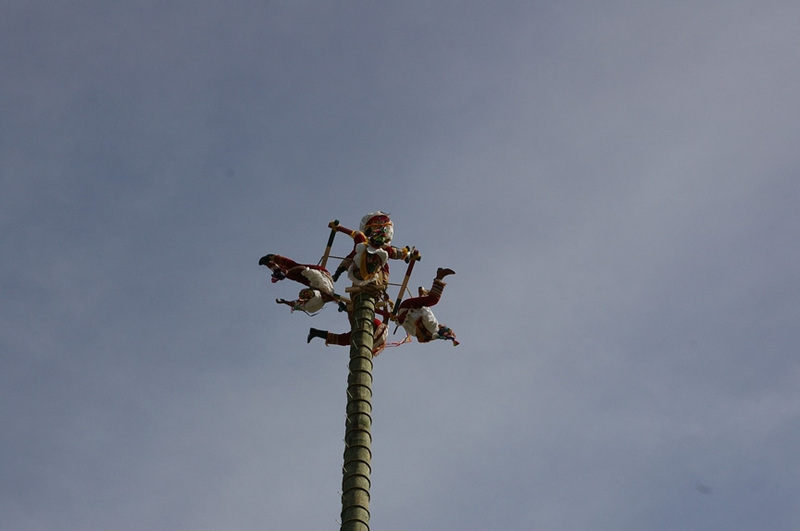 They again stopped in the four cardinal directions, asking for the blessings of the Creator before four of them ascended the pole. 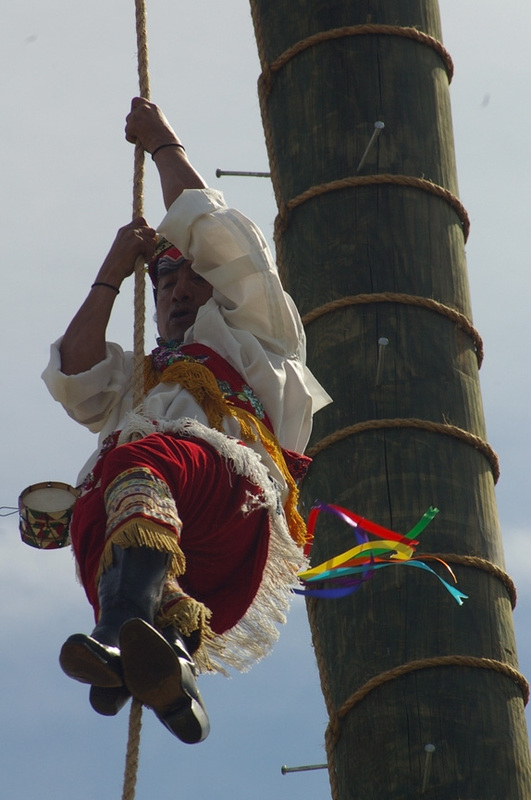 One upon the platform, they wound the ropes that they would use to descend from the wooden platform up to the wooden drum on which the shaman would stand. By the time they were finished, only a small amount of rope remained. They tied that end around their waists. 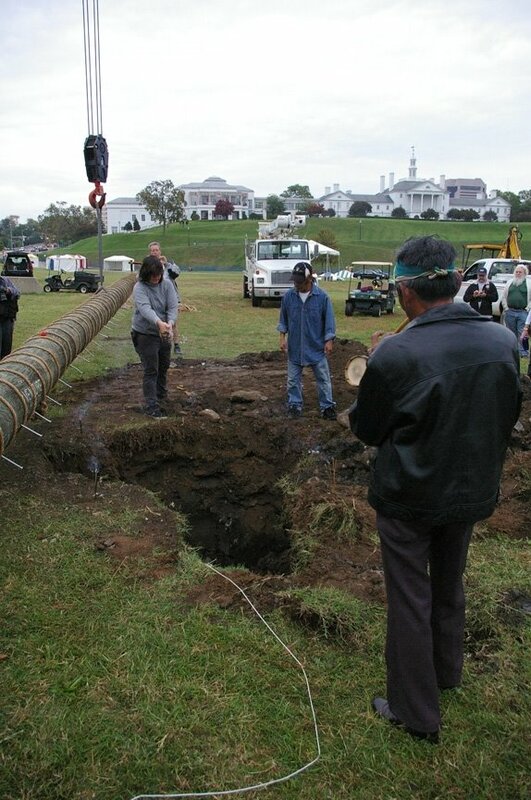 Symbolism is just as important in the sundance as it was in the blessing ceremony. For example, the pole itself represents the connections between Earth and heaven. 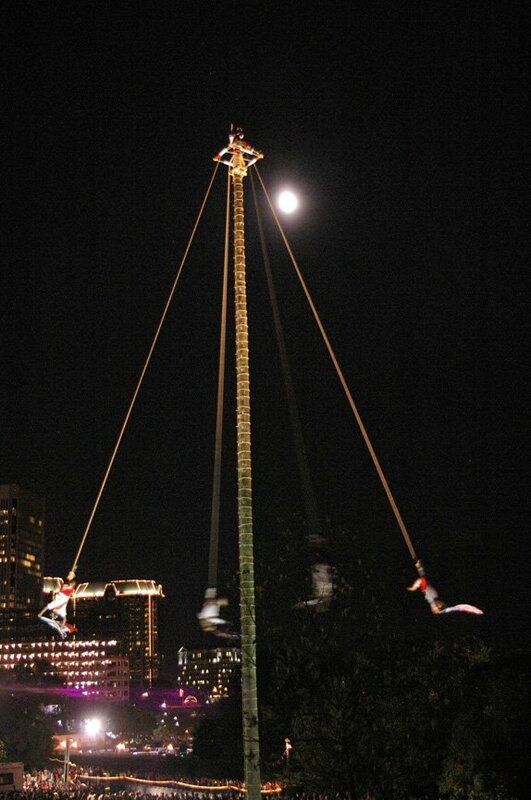 The rope that is wrapped around the pole from bottom to top symbolizes the umbilical cord. The shaman normally ascends last, but Simbrón, because he remains on the ground to describe some of what is to happen to the festival crowd, this time ascended last. 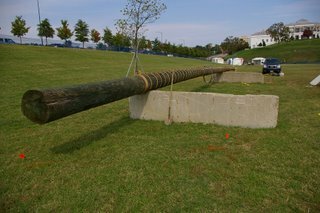 One he reached the top, he took a seat on the frame and Garcia moved to take a seat on the wooden drum resting upon the tip of the pole. 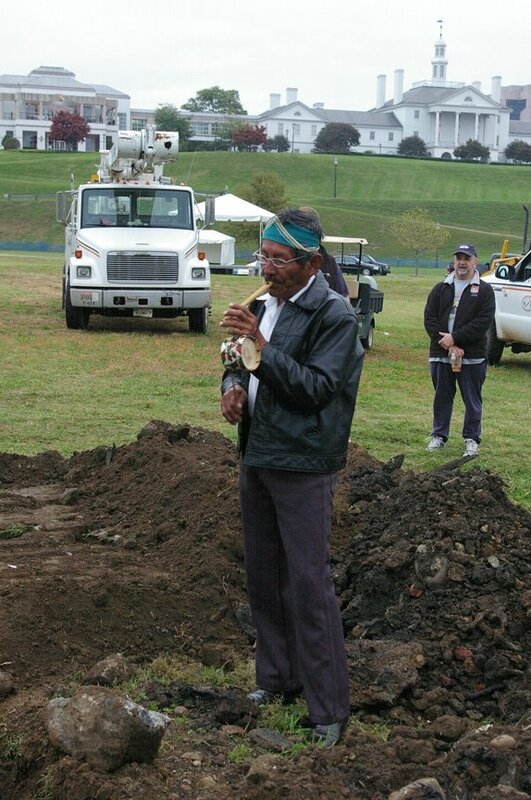 Once there, Garcia began playing the flute, which represents lightning, and drum, which represents Mother Earth. The flute carries a song offering to heaven, the drum carries the shaman’s footfalls through the pole to the Earth. Garcia stood upon the drum. 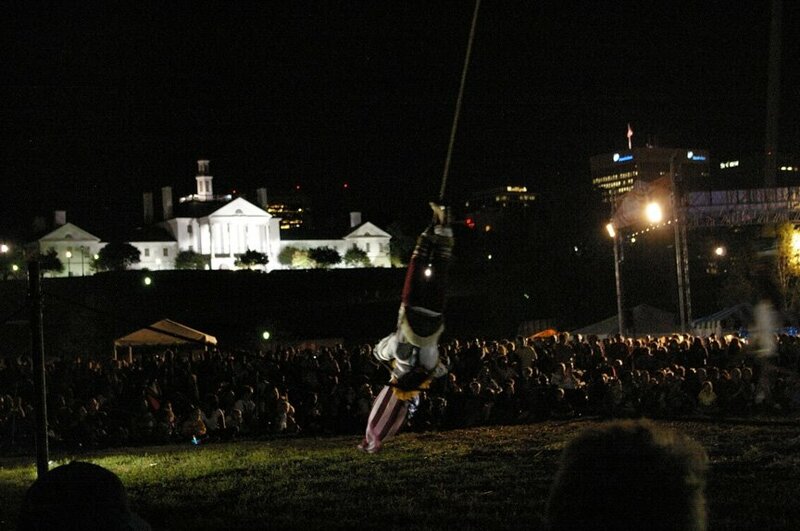 Nothing but his balance upon the wobbly drum kept him from falling to the Earth. The crowd, in awe of his feat, applauded in appreciation. He sat upon the drum, bracing his feet upon the frame, while continually playing his tune. 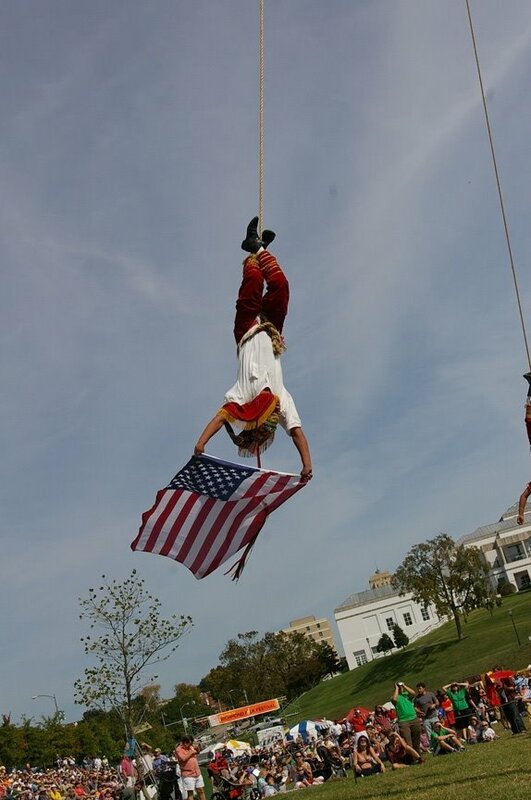 Then the four flyers fell backwards off the platform, each slowly unwinding from the pole upside down in graceful arcs – one held an American flag, while another held a Mexican flag. After a slow descent, they righted themselves near the ground, each holding his rope firmly. 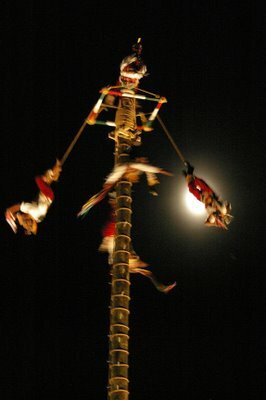 The shaman stopped his tune, climbed to the edge of the frame, grabbed a rope and descended hand-over-hand to the ground. I am a geographer (specifically a biogeographer), journalist, and author. My book, Upheaval from the Abyss, was published by Rutgers University Press in 2002. My writing has appeared in publications ranging from the books "The Science of Dune" and "The Science of Michael Crichton" (both published by BenBella Books in 2008); magazines such as The Lancet, The Lancet Infectious Disease, Geotimes, Mercator's World, Vegetarian Times and Woods Hole Currents; the radio programs Our Ocean World and MicrobeWorld; the news service Agence France-Presse; newspapers such as The (Petersburg, Va.) Progress-Index; the Richmond (Va.) Times-Dispatch; and The (Shreveport, La.) Times; and academic publications, including Bulletin of the Ecological Society of America, Encyclopedia of the Developing World, Encyclopedia of Genetics, Magill’s Encyclopedia of Science: Plant Life, Magill’s Medical Guide, and the Virginia Journal of Science.